Sir Aaron Klug OM PRS (born 11 August 1926) is a Lithuanian-born British chemist and biophysicist, and winner of the 1982 Nobel Prize in Chemistry for his development of crystallographic electron microscopy and his structural elucidation of biologically important nucleic acid-protein complexes. Following his PhD, Klug moved to Birkbeck College in the University of London in late 1953, and started working with Rosalind Franklin in John Bernal's lab. This experience aroused a lifelong interest in the study of viruses, and during his time there he made discoveries in the structure of the tobacco mosaic virus. In 1962 he moved to the newly built Medical Research Council (MRC) Laboratory of Molecular Biology (LMB) in Cambridge. Over the following decade Klug used methods from X-ray diffraction, microscopy and structural modelling to develop crystallographic electron microscopy in which a sequence of two-dimensional images of crystals taken from different angles are combined to produce three-dimensional images of the target. In 1962 Klug was offered a teaching Fellowship at Peterhouse, Cambridge. 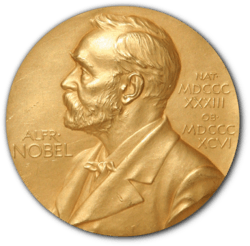 He went on teaching after his Nobel Prize because he found the courses interesting and was later made an Honorary Fellow at the College. He is also a member of the Board of Scientific Governors at The Scripps Research Institute. ↑ Shafrir, E. (1994). 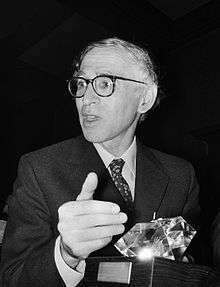 "Aaron Klug--a pioneer of crystallographic electron microscopy". Israel journal of medical sciences. 30 (9): 734. PMID 8088991. 1 2 3 "Sir Aaron Klug OM FRS". London: Royal Society. Archived from the original on 2015-11-07. ↑ Wakabayashi, K. (1983). "Accomplishment of Dr. Aaron Klug, winner of Nobel prize in chemistry, 1982". Tanpakushitsu kakusan koso. Protein, nucleic acid, enzyme. 28 (2): 156–157. PMID 6342048. ↑ Shampo, M. A.; Kyle, R. A. (1994). "Sir Aaron Klug--Nobel Prize winner for chemistry". Mayo Clinic proceedings. Mayo Clinic. 69 (6): 556. doi:10.1016/S0025-6196(12)62247-2. PMID 8189761. ↑ Finch, John (2008). A Nobel Fellow On Every Floor. Medical Research Council. ISBN 978-1-84046-940-0. this book is all about the MRC Laboratory of Molecular Biology, Cambridge. ↑ Aaron Klug archive collection - Churchill Archives Centre finding aid. ↑ "The Papers of Sir Aaron Klug". Churchill Archives Centre. Retrieved 2016-03-03. ↑ "Desert Island Discs – Castaway : Sir Aaron Klug first broadcast 2002-05-12". BBC. ↑ Amos, L.; Finch, J. T. (2004). "Aaron Klug and the revolution in biomolecular structure determination". Trends in Cell Biology. 14 (3): 148–152. doi:10.1016/j.tcb.2004.01.002. PMID 15003624. ↑ "Eminent Petreans". University of Cambridge. Archived from the original on 2015-06-26. ↑ "Advisory Council of the Campaign for Science and Engineering". Sciencecampaign.org.uk. Retrieved 11 February 2011. ↑ "Scripps Research Scientific Board Meets in Florida". Scripps Research Institute. 2004-01-26. Retrieved 2016-03-03. ↑ "Aaron Klug (1926–)". Jewish Virtual Library. Retrieved 7 November 2009. ↑ "Certificate of Election EC/1969/19: Aaron Klug". London: Royal Society. Archived from the original on 2015-11-08. ↑ "National Orders awards 27 September 2005". State of South Africa. 29 September 2005. Retrieved 13 September 2007. Wikimedia Commons has media related to Aaron Klug.